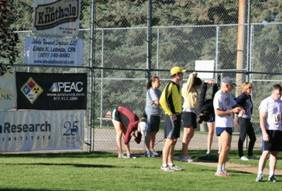 September 13th in Laramie, WY the 7th annual Always a Cowboy 8K race was held and the event was a big success. AristaTek was proud to be one of the sponsors of this worthy event. AristaTek joined several other sponsors to raise funds for the University of Wyoming Track and field teams. The funds raised are used for the purchase of equipment, uniforms, traveling expenses for athletes, and to supplement portions of scholarships for those that are not on a full-ride scholarship. 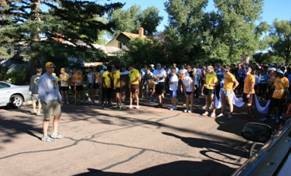 This event was created in honor of the eight members of the University of Wyoming Cross Country and track teams who were killed in an early morning vehicle accident on September 16, 2001. The eight members of the UW cross country and track teams were traveling north towards Laramie in a jeep Wagoneer when they were struck head on by a one ton Chevrolet pickup truck driven by another student. The loss of these young people was a terrible blow to the University of Wyoming community and to the community of Laramie. The student driving the truck was determined to be driving under the influence of alcohol, and was later found to be guilty of negligent homicide and is serving his sentence at the Wyoming State Penitentiary. The Always a Cowboy 8K race helps to honor these athletes and brings home the horrific results of drinking and driving. Of these athletes five were from Wyoming, one from Oregon, one from Colorado, and one from Canada. More than 200 participants turned out to honor the memory of eight cross country and track team members who were killed Sept. 16, 2001 in an early morning vehicle accident as they headed back to Laramie. More than 200 athletes turned out to raise funds and honor the memory of these fallen young people. The hope is to continue this event each year as an ongoing way to support the University of Wyoming Track and Field teams and send a message about the dangers of drinking and driving.